A mental image or mental picture is the representation in a person's mind of the physical world outside of that person. It is an experience that, on most occasions, significantly resembles the experience of perceiving some object, event, or scene, but occurs when the relevant object, event, or scene is not actually present to the senses. There are sometimes episodes, particularly on falling asleep (hypnagogic imagery) and waking up (hypnopompic), when the mental imagery, being of a rapid, phantasmagoric and involuntary character, defies perception, presenting a kaleidoscopic field, in which no distinct object can be discerned. Mental imagery can sometimes produce the same effects as would be produced by the behavior or experience imagined. The nature of these experiences, what makes them possible, and their function (if any) have long been subjects of research and controversy in philosophy, psychology, cognitive science, and, more recently, neuroscience. As contemporary researchers use the expression, mental images or imagery can comprise information from any source of sensory input; one may experience auditory images, olfactory images, and so forth. However, the majority of philosophical and scientific investigations of the topic focus upon visual mental imagery. It has sometimes been assumed that, like humans, some types of animals are capable of experiencing mental images. Due to the fundamentally introspective nature of the phenomenon, there is little to no evidence either for or against this view. Philosophers such as George Berkeley and David Hume, and early experimental psychologists such as Wilhelm Wundt and William James, understood ideas in general to be mental images. Today it is very widely believed that much imagery functions as mental representations (or mental models), playing an important role in memory and thinking. William Brant (2013, p. 12) traces the scientific use of the phrase "mental images" back to John Tyndall's 1870 speech called the "Scientific Use of the Imagination." Some have gone so far as to suggest that images are best understood to be, by definition, a form of inner, mental or neural representation; in the case of hypnagogic and hypnapompic imagery, it is not representational at all. Others reject the view that the image experience may be identical with (or directly caused by) any such representation in the mind or the brain, but do not take account of the non-representational forms of imagery. Common examples of mental images include daydreaming and the mental visualization that occurs while reading a book. Another is of the pictures summoned by athletes during training or before a competition, outlining each step they will take to accomplish their goal. When a musician hears a song, he or she can sometimes "see" the song notes in their head, as well as hear them with all their tonal qualities. This is considered different from an after-effect, such as an after-image. Calling up an image in our minds can be a voluntary act, so it can be characterized as being under various degrees of conscious control. The eighteenth century British writer, Dr. Samuel Johnson, criticized idealism. When asked what he thought about idealism, he is alleged to have replied "I refute it thus!" as he kicked a large rock and his leg rebounded. His point was that the idea that the rock is just another mental image and has no material existence of its own is a poor explanation of the painful sense data he had just experienced. David Deutsch addresses Johnson's objection to idealism in The Fabric of Reality when he states that, if we judge the value of our mental images of the world by the quality and quantity of the sense data that they can explain, then the most valuable mental image—or theory—that we currently have is that the world has a real independent existence and that humans have successfully evolved by building up and adapting patterns of mental images to explain it. This is an important idea in scientific thought. Critics of scientific realism ask how the inner perception of mental images actually occurs. This is sometimes called the "homunculus problem" (see also the mind's eye). The problem is similar to asking how the images you see on a computer screen exist in the memory of the computer. To scientific materialism, mental images and the perception of them must be brain-states. According to critics, scientific realists cannot explain where the images and their perceiver exist in the brain. To use the analogy of the computer screen, these critics argue that cognitive science and psychology have been unsuccessful in identifying either the component in the brain (i.e., "hardware") or the mental processes that store these images (i.e. "software"). Some educational theorists have drawn from the idea of mental imagery in their studies of learning styles. Proponents of these theories state that people often have learning processes that emphasize visual, auditory, and kinesthetic systems of experience. According to these theorists, teaching in multiple overlapping sensory systems benefits learning, and they encourage teachers to use content and media that integrates well with the visual, auditory, and kinesthetic systems whenever possible. Educational researchers have examined whether the experience of mental imagery affects the degree of learning. For example, imagining playing a 5-finger piano exercise (mental practice) resulted in a significant improvement in performance over no mental practice — though not as significant as that produced by physical practice. The authors of the study stated that "mental practice alone seems to be sufficient to promote the modulation of neural circuits involved in the early stages of motor skill learning." ↑ Eysenck, M. W. (2012). Fundamentals of cognition, 2nd ed. New York, NY: Psychology Press. ↑ Wright, Edmond (1983). "Inspecting images". Philosophy. 58 (223): 57–72 (see pp. 68–72). doi:10.1017/s0031819100056266. 1 2 Kappes, Heather Barry; Morewedge, Carey K. (2016-07-01). "Mental Simulation as Substitute for Experience". Social and Personality Psychology Compass. 10 (7): 405–420. doi:10.1111/spc3.12257. ISSN 1751-9004. ↑ Sachs, Oliver (2007). Musicophilia: Tales of Music and the Brain. London: Picador. pp. 30–40. ↑ Pinker, S. (1999). How the Mind Works. New York: Oxford University Press. ↑ Farah, Martha J. (Sep 30, 1987). "Is visual imagery really visual? Overlooked evidence from neuropsychology". Psychological Review. 95 (3): 307–317. doi:10.1037/0033.295X.95.3.307. PMID 3043530. ↑ Cichy, Radoslaw M.; Heinzle, Jakob; Haynes, John-Dylan (June 10, 2011). "Imagery and Perception Share Cortical Representations of Content and Location" (PDF). Cerebral Cortex. 22 (2): 372–380. doi:10.1093/cercor/bhr106. Fichter, C. & Jonas, K. (2008). Image Effects of Newspapers. How Brand Images Change Consumers’ Product Ratings. Zeitschrift für Psychologie / Journal of Psychology, 216, 226-234. Kosslyn, Stephen M., William L. Thompson, Mary J. Wraga and Nathaniel M. Alpert (2001) Imagining rotation by endogenous versus exogenous forces: Distinct neural mechanisms. NeuroReport 12, 2519–2525. Logie, R.H., Pernet, C.R., Buonocore, A., & Della Sala, S. (2011). 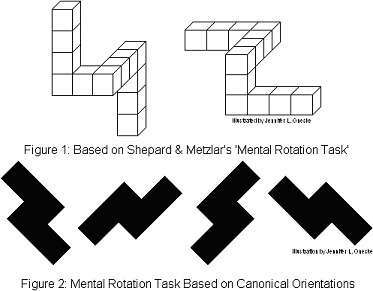 "Low and high imagers activate networks differentially in mental rotation". Neuropsychologia, 49, 3071-3077. Marks, D.F. (1973). Visual imagery differences in the recall of pictures. British Journal of Psychology, 64, 17-24. Marks, D.F. (1995). New directions for mental imagery research. Journal of Mental Imagery, 19, 153-167.